Dubai is known for its incredible skyscrapers, beautiful beaches, and colorful local heritage. If you want a convenient and comfortable way of exploring the city, hop on a bus and explore Dubai’s most famous attractions on top of a double decker bus. Joining the Dubai Hop On Hop Off Bus toursis an exciting way to experience the city. These tours will take you all over the city with a stop to the famous sights and attractions such as the majestic Burj Khalifa! There are two main companies(Dubai City Sightseeing Bus Tours & Dubai Big Bus Tours) that you can book. In fact, there are also night bus tours if you want to explore Dubai’s fantastic sights after dark. It’s important to choose the tour that can cover all the places that you want to see in Dubai. Of course, opt for a bus tour that can offer the best value for your money. The Dubai City Sightseeing Bus Tours is a hop-on-hop-off bus and one of the major ways to explore Dubai. Dubai is the marvel of the middle east, a city, and an emirate in the United Arab Emirates known for its luxury ultramodern architecture, nightlife and many more. The Dubai City Sightseeing Bus Tour has 39 stops around this beautiful city which connects to all the major attractions. The Dubai City Sightseeing Bus Tours is a hop-on-hop-off bus and one of the major ways to explore Dubai. Dubai is the marvel of the middle east, a city, and an emirate in the United Arab Emirates known for its luxury ultramodern architecture, nightlife and many more. The Dubai City Sightseeing Bus Tour has 39 stops around this beautiful city which connects to all the major attractions. Enjoy free access to some select attractions in Dubai and embark on walking tour, night tour, and cruise tours. You can board the Dubai City Sightseeing open-top double-decker bus at any of the 39 stops and its eight routes around the city. Enjoy 360-degree panoramic views of Dubai's attractions and landmarks with a 1, 3 or 7-day pass to enjoy the entire loop of each route which runs every 20-30 minutes with an onboard audio commentary available in 12 languages. Your City Sightseeing bus ticket gives you free access to the Dubai Museum, a dhow cruise, VIP entry to the Global Village and many discounts. Dubai is regarded as the "City of Gold" and one of the best ways to see this amazing city is through the Dubai Big Bus Hop-On Hop-Off Tours (Classic (24-hours), Premium (48-hours) or Deluxe (120-hours) passes). With this pass, you get to explore Dubai at your own leisure time on the Dubai Big Bus Hop-On-Hop-Off sightseeing bus tour and experience this world wonder. Listen to the audio commentary on-board the bus in 12 different languages as you journey along the Red, Green and Blue Routes. The Red Route also has an additional Live Guide commentary in English. You can also enjoy the comfy air-conditioned lower deck or see Dubai on top the open-top double-decker bus with panoramic views. The tour takes 1 to 2 hours according to the routes with a complimentary Dhow Cruise, entry to 10 museums and Night Tour. Explore the city, beaches, the marina, heritage sites, museums, and its glamorous shopping malls with discounts at diners. Save money and time with the Big Bus Dubai and Abu Dhabi Combo Ticket. Enjoy 24 hours of classic sightseeing in both Dubai and Abu Dhabi. With this tour ticket, you get unlimited trips aboard the Big Bus open-top, double-decker bus in Dubai for a whole day, and also do the same 24-hour bus tour in Abu Dhabi. Marvel at some of the major top attractions in the United Arab Emirates (UAE) such as the world's tallest building, the Burj Khalifa & Dubai Creek and Sheikh Zayed Mosque in Abu Dhabi etc You also get to enjoy a free Arabic Sailboat Cruise also known as the "Dubai Dhow", a complimentary access to other attractions around the two cities and round-trip intercity bus shuttle between Dubai and Abu Dhabi. Experience Dubai and its beautiful scenery onboard the Citysightseeing open-top, double-decker hop-on-hop-off bus. Hop-on and off the double-decker bus as many times as you want and enjoy the audio commentary in over 8 languages. 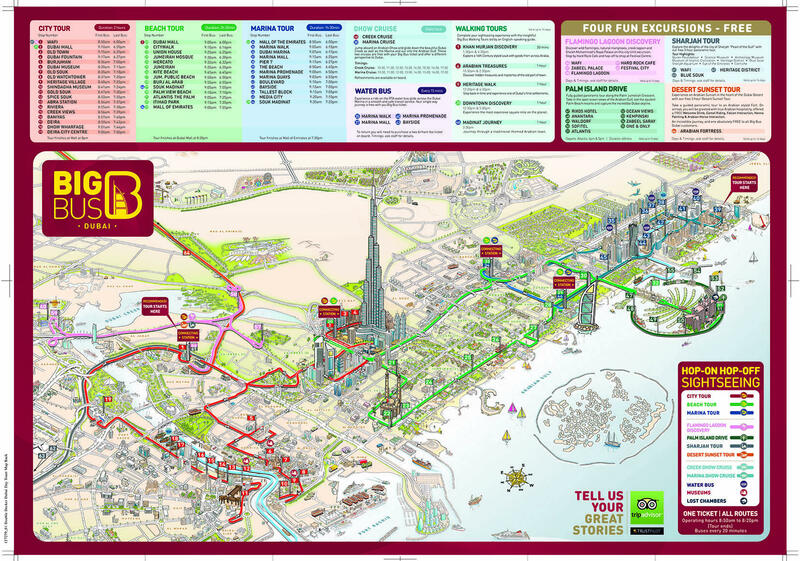 This is a perfect way to explore the city by planning your journey around Dubai at your own pace. Visit places like the Burj Khalifa, Burj Al Arab, Dubai Mall, and Atlantis The Palm. Get exclusive access to the Dubai Museum and also an hour Dhow Cruise around Dubai Marina. This ticket gets you entry into the Dubai's Underwater Zoo and the Dubai Aquarium. This is a magnificent way to see this amazing city. Audio commentary in multi-languages (English, Arabic, German, French, Italian, Spanish, Russian, Hindi, Farsi, Chinese, Brazilian Portuguese and Japanese). Live Guided English commentary on Red Route. Audio guide in over 9 languages (English, Spanish, French, German, Italian, Japanese, Chinese, Portuguese, Russian, Arabic, Farsi, Hindi, Turkish). Entry to the Dubai Aquarium and Underwater Zoo. Dubai Aquarium and Underwater Zoo opens daily from 10:00 – 00:00, with the last entry by 23:30. Blue Route: Dubai Mall Bus Stop and any of the stops. You can start the tour from any of the stops in Dubai and Abu Dhabi depending on where you buy your ticket from. Some may require you redeem and use the tour ticket first in Dubai. It is a 24-hour tour each for both Dubai and Abu Dhabi. Big Bus operates from 9:00 am to 5:00 pm at regular intervals in Dubai and Abu Dhabi. You can start your tour from: The Dubai Mall, Mall of the Emirates, Atlantis The Palm, and the Dubai Aquarium & Underwater Zoo from 9 am - 6 pm. Night tours start from 6 pm - 10 pm. The Pyramids Entrance, Dubai Mall, Dubai Fountain, Burjuman, Dubai Museum, Old Souk, Heritage Village, Gold Souq, Spice Souk, Riviera, Baniyas Road, Dhow Wharfage, Deira City Center and many more. Dubai Mall, City Walk, Union House, Jumeirah Mosque, Mercato, Jumeirah, Kite Beach, Jumeirah Public Beach, Burj Al Arab, Souk Madinat, Atlantis the Palm, Al Ittihad Park, Mall of the Emirates, Dubai Marina, Marina Mall, Pier 7, The Beach, Marina Promenade, Marina Quays, Boulevard, Bayside, Tallest Block, Media City and many more. Dubai Museum, Coin Museum, Shindagha Museum, Horse Museum, Spice & Gold Souk District, Museum of Poet Al-Oqailiand more. Marina Mall, Etihad Tower, Etihad Gallery, The Sheikh Zayed Grand Mosque, Eastern Mangroves, Abu Dhabi Mall, Saadiyat Island Exhibition Centre, Abu Dhabi Corniche, Souk WTC, Al Hosn Fort, Markaziyah Park, Public Beach, Heritage Centre, and Dhow Corniche Cruise. Manarat Al Saadiyat, Ferrari World Theme Park & Yas Mall, Yas Plaza, Masdar City, Yas Viceroy, Yas Marina, Yas Marina Circuit, Yas Waterworld park, Free shuttle buses from Dubai to Abu Dhabi and more. The Dubai Mall, Mall of the Emirates, Atlantis The Palm, Dubai Aquarium & Underwater Zoo, Dubai Museum, Global Village (free entry), Burj Khalifa, Burj Al Arab, Souk Madinat, Old Souk, Gold Souk, Riviera Hotel, Dubai Creek, Al Ghurair Centre, Sheikh Zayed Road, Dubai Festival City Mall, Dubai Fountains, Jumeirah Mosque, Etihad Museum, Wild Wadi Waterpark, Kite Beach, Ski Dubai, Miracle Garden, and many more. Free intercity shuttleround-trip from Dubai to Abu Dhabi and Back. Free Dubai ‘dhow’ (Arabic sailboat) cruise and complimentary access to many other attractions. Magical Night Tour, Dubai Museum, Guided Downtown Discovery Walking Tour, Abu Dhabi Corniche Dhow Cruise. Free entrance to Sheikh Saeed Al Maktoum’s House in Dubai. Enjoy a Night Tour, Dhow Cruise, free Entry to Dubai Museum and the Dubai Global Village. Complimentary water on board the buses and coffee with a buy one get one free at select Costa outlets. 20% discount on Coffee at the Sky Tower in Abu Dhabi. Green Route is for cruise passengers only. To get a full refund, tourists must cancel at least 24 hours in advance before the start date of the tour. Free shuttle from the Cruise terminals to the main starting point every hour. You must cancel your ticket 24-hours before the tour to get a full refund. Buses are wheelchair accessible and stroller accessible. Adults are from 12-99 years, while Children are from 6-11 years. Dubai Hop On Hop Off Bus Tour with Underwater Zoo and Dubai Aquarium Entry voucher is valid for 3 months from the date get it. To get a full refund, tourists must cancel their bookings 34 hours earlier in advance before the tour. Present either a printed or an electronic voucher to start any activity. Present your smartphone or printed vouchers to a Big Bus Tours staff at any of the stops or on the bus to get your tickets. Present a printed paper ticket or the mobile voucher to the driver at any of the stops to start your tour in Dubai or Abu Dhabi. You can either present the printed paper version of the tour ticket or a mobile ticket. Where to Buy Dubai City Sightseeing Bus Tours? We are comparing the Best Dubai City Sightseeing Bus Tour Prices from leading online Tours and Ticket suppliers, try to find you cheap tickets prices on the market. Where to Buy Dubai Big Bus Hop-On Hop-Off Tour? Explore Dubai's main attractions and learn more about this cosmopolitan city's history on a comfy City Sightseeing Bus Tour. Choose between a 1-day, 3-day or 7-day pass to experience unlimited access to the 7 routes which takes you through over 35 major attractions in Dubai such as Burj Al Arab, Jumeirah Beach Park, Madinat Jumeirah, Burj Khalifa, the Dubai Museum, Gold Souk, Dubai Creek, Sheikh Zayed Road, and DIFC. Relax in an open-top double-decker Dubai City Sightseeing bus and enjoy a 360-degree view of the city's landmarks, hop-on and hop-off and any of the stops to explore on foot to get a closer look at the things that interest you. While onboard, you can also plug into the entertaining audio commentary which is available in 12 different languages with more information about the sights along the routes. The Dubai City Sightseeing Bus Tours run every 20 to 30 minutes, which means you can't be stuck waiting for a bus too long. Get a feel of Dubai with the City Sightseeing Bus Night Tour and see the bright side of this city at night. Enjoy additional complimentary tours and activities with your Dubai City Sightseeing Bus Tour pass with VIP ticket to the Global Village, free entry to the Dubai Museum, Dhow cruise and many more. Free access to the Dubai Museum, Dubai Aquarium, the Underwater Zoo, Dhow Cruise and more. You get free complimentary entry to the Dubai Museum, VIP ticket to the Global Village, Dubai Dhow Cruise and more with walking tour experiences included. With the Dubai City Sightseeing Bus Tours ticket, you get a special discount at some restaurants, beaches, shops and more. How much is a 1/2/3 day Dubai City Sightseeing Bus Tour? The Dubai City Sightseeing Bus Tours offers tourists the choice of days they wish to spend exploring Dubai with the 1-day, 3-day, or 7-day passes at their own pace by creating their own itinerary. Tourists get to travel along 7 routes and see top attractions, landmarks including Gold Souk, Sheikh Zayed Road, Jumeirah Beach Park, the Dubai Museum, Burj Khalifa, Burj Al Arab, Dubai Creek, Madinat Jumeirah, and many more. The Dubai City Sightseeing Bus Tours offers comfortability to tourists with a 360-degree panoramic view of the city, tourists can hop-on and hop-off at any stop of interest to further explore on foot for a closer look at the attractions. The bus runs every 20-30 minutes with audio commentary in 12 different languages to inform tourists about the city and its attractions. This Dubai City Sightseeing Bus Tour pass gives tourists an additional free access and the Global Village VIP ticket, entry to Dubai Museum, Dubai Dhow Cruise and more. Is the City Sightseeing Bus Dubai Right for Me? This Dubai City Sightseeing Bus Tours is a super exciting way for tourists to get acquainted with the cosmopolitan city as well as learning about its top attractions and history. This is right for tourists who wish to enjoy their time and money while also having fun at the same time. With a 1, 3 or 7-day Dubai City Sightseeing Bus Tours pass, you get to enjoy a lot of benefits while travelling along the 7 routes which cover over 35 top attractions such as the Burj Khalifa (the tallest building in the world), Dubai Creek, Dubai Museum, Jumeirah Beach Park, Gold Souk, and many more. You get to enjoy the panoramic views of Dubai onboard the open-top double-decker bus with audio commentary in 12 different languages. You can hop-off at any stop that draws your attention to explore on foot and hop back on at the next stop. You don't get to wait for long to get a bus, as buses frequently run every 20 to 30 minutes. You also get free entry to some attractions and places which only comes with the City Sightseeing Bus Tours ticket such as the Dubai Dhow Cruise, Dubai Museum, Dubai Aquarium and Underwater Zoo, VIP pass to the Global Village and more. This is an exciting way to see Dubai. Experience the jaw-dropping sights of Dubai with a Dubai Big Bus Tours Classic Pass (1-day), Premium Pass (2-days) or Deluxe Pass (5-days). Travel along three routes (Red, Green and Blue Routes) on this hop-on-hop-off journey while listening to the onboard live commentary on the Red Route and choose from 12 different language audio commentary on the other routes to get more knowledge about this city of gold. See Dubai's skyline onboard an open-top double-decker bus with panoramic views or cruise around to see the city, its marina district and its white beaches at your own pace. Enjoy the air-conditioned lower deck as you take your 2-hour journey around this city; marvel at the Atlantis, the tallest building in the world the 'Burj Khalifa”, Burj Al Arab, Dubai Museum, visit the glamorous Dubai Shopping Mall with over 1,200 stores and many more. The Dubai Big Bus Tour ticket comes with complimentary tours such as the Dubai Dhow Cruise, access to 10 museums and a free Night Tour. Deluxe 5 Day Ticket with free entry to Atlantis Lost Chambers Aquariums and desert sunset adventure. You get free complimentary walking tours, night tours, free entry to 10 museums, Dhow cruise, Atlantis Lost Chambers Aquariums (Deluxe Pass) and more included in the Dubai Big Bus Tours ticket. With the Dubai Big Bus Tours ticket, you get a special discount at restaurants, beaches and more. How much is a 1/2/3 day Dubai Big Bus Hop-on hop-off Tours? We are comparing the Best Dubai Big Bus Hop-On Hop-Off Tour Prices from leading online Tours and Ticket suppliers, try to find you cheap tickets prices on the market. City Tour - Red Route (Live English guide plus recorded commentary) : Dubai Mall, City Walk, Wafi Mall, Burjuman, Dubai Museum, Old Souk, Heritage Village, Gold Souk, Spice Souk, Riviera, and Deira City Center. Beach Tour - Green Route: Dubai Mall, Jumeirah Public Beach, Burj Al Arab, Souk Madinat, and Mall of the Emirates. Marina Tour - Blue Route: Mall of the Emirates, Marina Walk, Marina Mall, The Beach, Marina Promenade, Bayside, Tallest Block, Media City, Atlantis The Palm, and Al Ittihad Park. Dhow Cruises: Creek Dhow Cruise and Marina Dhow Cruise. The Dubai Big Bus Tour offers tourists the ability to see Dubai and make the best out of their stay. 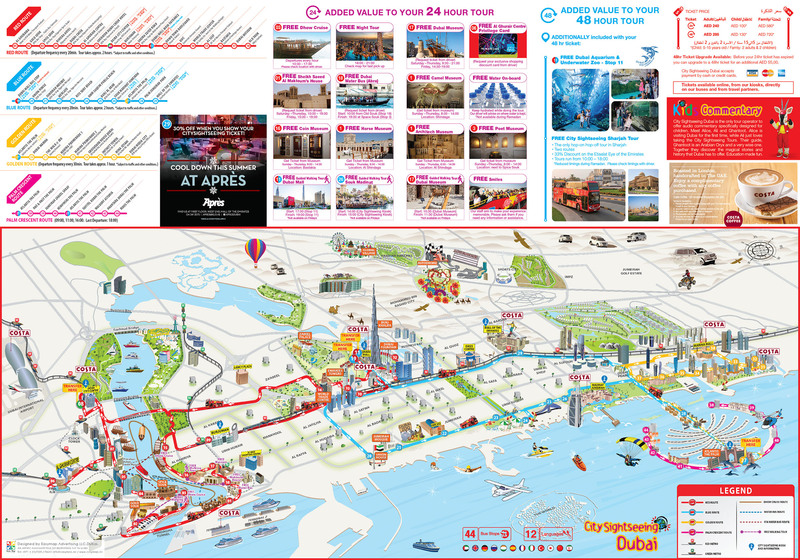 This Big Bus tour ticket lets tourists explore Dubai through 3 (Red, Green and Blue Route) routes, which runs through all the major attractions in the city. Tourists get a convenient and comfortable open-top double-decker bus with either the Classic (1-day), Premium (2-days) or Deluxe (5-days) pass. The Red Route has the only live English commentary onboard while the other routes have pre-recorded audio commentaries in 12 languages to hear about Dubai's past history and future as well. Tourists get to see Dubai's beautiful skyline filled with magnificent architectural marvels such as the tallest building in the world the 'Burj Khalifa”, Burj Al Arab, the Atlantis Hotel, Dubai Museum, and the Dubai Shopping Mall just to name a few. 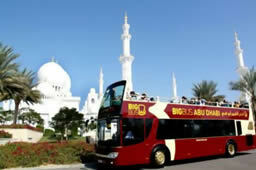 The Dubai Big Bus Tours offers tourists a 360-degree panoramic view of the city during the 2-hour trip along each route. This ticket also comes with extra complimentary benefits which include free entry to 10 museums, Night Tour, Dubai Dhow Cruise and walking tours as well. Is the Dubai Big Bus Tours Right for Me? The Dubai Big Bus Tours is right for both children and adults or anyone who wants more for less. With this bus pass, you get to enjoy the fully air-conditioned lower deck of the Dubai Big Bus with panoramic windows. See the city in a wider angle atop the open-top double-decker bus, as you listen to the entertaining pre-recorded audio commentaries in 12 languages while on the journey through the city on 3 (Red, Green, and Blue) routes. The Red Route has the only live English commentary onboard. Choose between the Classic (1-day), Premium (2-days) or Deluxe (5-days) Big Bus tour pass to explore Dubai for 1-2-hours per loop as you admire and marvel at world wonders such as Burj Khalifa, the Atlantis Hotel, Burj Al Arab, Dubai Shopping Mall, Dubai Museum, Gold Souk, Jumeirah Public Beach and many more. The Dubai Big Bus Tour pass also comes with other amazing benefits which include complimentary walking tours, night tours, Dhow cruise, entry to 10 museums, Dubai Aquarium & Underwater Zoo and many more. Explore Dubai and Abu Dhabi aboard the Big Bus Dubai and Abu Dhabi Tour combo. With this combo ticket, you save time and money visiting two places, Dubai and Abu Dhabi for 24-hours in each of the cities. Enjoy panoramic views of both cities, onboard a fully air-conditioned open-top double-decker bus, with free WiFi to share your wonderful moments with friends on social media. See Dubai for a whole day visiting some of its top attractions and do the same whole day tour in Abu Dhabi the next day. Learn about the top attractions with the onboard audio commentary in 12 languages. Visit attractions in both cities such as the Dubai Creek, Burj Khalifa (tallest building in the world), Sheikh Zayed Mosque Abu Dhabi, Sky Tower at Marina Mall and many more. This 1-day ticket gets you complimentary bottled water on the hop-on-hop-off bus, free Dhow "Arabic Sailboat Cruise", free inter-city shuttle bus from Dubai to Abu Dhabi and back to Dubai, and many more. There are a lot of complimentary tours included in the Big Bus Dubai and Abu Dhabi Combo Ticket such as the Dhow Cruise, Guided Downtown Discovery Walking Tour and many more. Tourists get 20% discounts with this Big Bus Dubai and Abu Dhabi Combo Ticket when you buy Coffee at the Sky Tower in Abu Dhabi. How much is a 1/2 Day Big Bus Dubai and Abu Dhabi Combo Ticket? NOTE: Children under 5 years ride the Big Bus tour for free and must be in the company of adults at all times. Where to Buy Dubai Hop On Hop Off Bus Tour with Underwater Zoo and Dubai Aquarium Entry Ticket? City Tour Red Route: WAFI, The Pyramids Entrance, Dubai Mall, Dubai Fountain, Burjuman, Dubai Museum, Old Souk, Heritage Village, Gold Souq, Spice Souk, Riviera, Baniyas Road, Dhow Wharfage, Deira City Center and many more. Beach Tours Green Route: : Dubai Mall, City Walk, Union House, Jumeirah Mosque, Mercato, Jumeirah, Kite Beach, Jumeirah Public Beach, Burj Al Arab, Souk Madinat, Atlantis the Palm, Al Ittihad Park, Mall of the Emirates, Dubai Marina, Marina Mall, Pier 7, The Beach, Marina Promenade, Marina Quays, Boulevard, Bayside, Tallest Block, Media City and many more. Museums: Dubai Museum, Coin Museum, Shindagha Museum, Horse Museum, Spice & Gold Souk District, Museum of Poet Al-Oqailiand more. Marina Mall, Etihad Tower, Etihad Gallery, The Sheikh Zayed Grand Mosque, Eastern Mangroves, Abu Dhabi Mall, Saadiyat Island Exhibition Centre, Abu Dhabi Corniche, Souk WTC, Al Hosn Fort, Markaziyah Park, Public Beach, Heritage Centre and Dhow Corniche Cruise. Island Shuttle (Yas Island) stopsManarat Al Saadiyat, Ferrari World Theme Park & Yas Mall, Yas Plaza, Masdar City, Yas Viceroy, Yas Marina, Yas Marina Circuit, Yas Waterworld park, Free shuttle buses from Dubai to Abu Dhabi and more. Tourists can start the tour from any of the stops in Dubai and Abu Dhabi depending on where they buy the ticket from. Some ticket companies may require you to redeem and use the tour ticket first in Dubai. This is a 24-hour tour each for Dubai and Abu Dhabi and it starts from 9:00 am to 5:00 pm at regular intervals in both cities. The Big Bus Dubai and Abu Dhabi Combo Ticket gives tourists the opportunity to save money and time touring two cities Dubai and Abu Dhabi for 24-hours each. With this ticket, tourists get to enjoy a lot of complimentary activities such as the Creek Dhow Cruise (Dubai) and Marina Dhow Cruise (Abu Dhabi), Free intercity shuttle round-trip from Dubai to Abu Dhabi and Back, Magical Night Tour, a Guided Downtown Discovery Walking Tour, free entry to Sheikh Saeed Al Maktoum’s House in Dubai and many more. Tourists can explore the Burj Khalifa in Dubai and the Ferrari World Theme Park & Yas Mall on Yas Island in Abu Dhabi the next day with many other attractions to see. The Big Bus open-top double-decker bus comes with free headphones to listen and learn from the multilingual audio commentary in 12 different languages, and free WiFi onboard for sharing your moments on social media. It is an awesome way to see Dubai and Abu Dhabi in 3600 views. Is the Big Bus Dubai and Abu Dhabi Combo Ticket right for me? The is right for everyone who likes adventure or want to see new things while moving around the world. The Big Bus Dubai and Abu Dhabi Hop-on Hop-off bus tour offer you the best of UAE with a combined tour of both Dubai and Abu Dhabi in 24 hours. You get to enjoy free entrance to places like the house of Sheikh Saeed Al Maktoum, Sky Tower at the Marina Mall in Abu Dhabi, Arabian Dhow Cruise in Dubai, and many more. With the Dubai and Abu Dhabi bus tour, you can explore both cities in 24-hours each and at your own pace. Onboard the bus, you also get free bottled water, panoramic views of the cities, free WiFi, free inter-city shuttle from Dubai to Abu Dhabi and back to Dubai. This is truly an amazing way to see Dubai and Abu Dhabi, two of the most beautiful cities in the United Arab Emirates. Visit amazing top attractions in Dubai onboard the City sightseeing open-top hop-on-hop-off bus. Hop on the double-decker bus to enjoy free WiFi, 360-degree views of the Dubai with a complimentary bottled water onboard the bus. Learn from the audio guide commentary in 13 languages as you ride along the stops scattered around the city and many more. Go on a guided Dubai walking tour and access to the Dubai Mall Aquarium & Underwater Zoo, with your hop-on hop-off bus pass. With this 1-day ticket, you also get a 60-min Arabian Dhow cruise around the Dubai Creek, entry to the Global Village, Dubai night tour and enjoy discounts at select Costa coffee shops etc. Plan your trip around Dubai, using the Dubai Hop On Hop Off Bus Tour with Underwater Zoo and Dubai Aquarium Entry ticket at your own pace. Marvel at the worlds tallest building the Burj Khalifa, Burj Al Arab, Dubai Mall, Atlantis The Palm, Mall of the Emirates, Emirate of Dubai and many more. Complimentary tours included in the Dubai Night Tour,Arabian dhow cruise, and Global Village. There are no discounts included in the Dubai Hop On Hop Off Bus Tour with Underwater Zoo and Dubai Aquarium Entry ticket. How much is a 1/2 Day Dubai Hop On Hop Off Bus Tour with Underwater Zoo and Dubai Aquarium Entry? NOTE: Children under 5 years ride the Dubai Hop On Hop Off Bus Tour with Underwater Zoo and Dubai Aquarium Entry tour for free and must be in the company of adults. Dubai Aquarium and Underwater Zoo open daily from 10:00 – 00:00, with the last entry by 23:30. Top Attractions include: The Dubai Mall, Mall of the Emirates, Atlantis The Palm, Dubai Aquarium & Underwater Zoo, Dubai Museum, Global Village (free entry), Burj Khalifa, Burj Al Arab, Souk Madinat, Old Souk, Gold Souk, Riviera Hotel, Dubai Creek, Al Ghurair Centre, Sheikh Zayed Road, Dubai Festival City Mall, Dubai Fountains, Jumeirah Mosque, Etihad Museum, Wild Wadi Waterpark, Kite Beach, Ski Dubai, Miracle Garden, and many more. Tourists can start the tour from any of the 40 stops in Dubai, but you can start from the following places You can start your tour from The Dubai Mall, Mall of the Emirates, Atlantis The Palm, and the Dubai Aquarium & Underwater Zoo from 9 am - 6 pm. Night tours start from 6 pm - 10 pm. Get on the Dubai Hop On Hop Off Bus Tour with Underwater Zoo and Dubai Aquarium Entry to enjoy exclusive sightseeing experience. The 24-hour ticket gives tourists access to a lot of attractions and a hop-on-hop-off bus trip along the 40 stops around Dubai. Tourists will learn from the audio guide commentary onboard the bus in 13 languages about all the city’s top attractions. Hop-on and off the bus to see top attractions like the Burj Khalifa, Burj Al Arab, Dubai Mall, Mall of the Emirates, Atlantis The Palm, Dubai Aquarium & Underwater Zoo, Dubai Museum, Global Village (free entry) and many more. The open-top double-decker bus is fully air-conditioned with panoramic windows and free WiFi onboard to help tourists share their moments. It also comes with a lot of complimentary activities such as a Dubai Night Tour, 60 minutes Arabian dhow cruise, and free entry to the Dubai Global Village, and many more. Is the Dubai Hop On Hop Off Bus Tour with Underwater Zoo and Dubai Aquarium Entry right for me? This tour is right for all, either tourist, friends, family, colleagues and more. With the 1-day Dubai Hop On Hop Off Bus Tour, you get admission into the Underwater Zoo and Dubai Aquarium. You can also visit some of the best places in Dubai such as the worlds tallest building (Burj Khalifa), Riviera Hotel, Dubai Creek, Al Ghurair Centre, Sheikh Zayed Road, Dubai Festival City Mall, Etihad Museum and more. The hop-on-hop-off open-top double-decker bus offers tourists the best services with complimentary water, free WiFi, panoramic windows, and audio guide with information about all the top attractions along the 40 stops along the routes in 13 languages. Enjoy free entry to the Dubai Museum, a free night tour, an hour Dhow boat cruise and many more with this ticket. This is an awesome way to explore the "City of Gold".